Road building. Men at work in the mountains. The Mono Log was a newsletter published by the men at Camp 37 beginning in July 1942. Camp No. 37 was located near Coleville, California, in Mono County on the Nevada border at around 5,141 feet. In the Antelope Valley on the West Walker River, it was 26 miles northwest of the county seat Bridgeport. The Mono National Forest, part of the Sierra, Toiyabe, Stanislaus and Invo National Forests, lay mostly in California and partly in Nevada. With fire-fighting the top work priority, men were stationed at spike camps located at Dog Valley, Galena Creek, June Lake, Lake Tahoe Shore, and other sites as needed. The American Friends Service Committee withdrew from the CPS program early March 1946, after struggling with criticism from COs and war resisters objecting to its cooperation with the Selective Service. Selective Service operated the camp until it closed later in the year. When the camp opened in June 1942, it drew conscientious objectors from a number of Friends camps, as well as from other camps. Twenty men came from CPS Camp No. 3, Patapsco, the first CPS camp to open in May 1941. Nineteen came from CPS Camp No. 23 at Coshocton, Ohio; twenty-six came from CPS Camp No. 14 in Merom, Indiana; twenty-five from CPS No. at Buck Creek, North Carolina; nineteen from CPS Camp No. 12 in Cooperstown, New York; nine from CPS Camp No. 11 in Ashburnham, Massachusetts; and eight each from two other Massachusetts camps, CPS Camp No. 9 in Petersham and Camp No. 10 in Royalston. Three men came from CPS No. 8 in Marietta, Ohio, a Mennonite Camp, one of whom became a camp director at Antelope. Since the men at American Friends Service Committee camps tended to constitute the most religiously diverse group of men, including men who had reported no religious affiliation when entering CPS, the men at Antelope, when entering CPS reported more than sixteen different denominational affiliations. Antelope opened because of the shortage of men to fight fires. The former Civilian Conservation Corps had closed, leaving the area without crews. In addition men went to work for war industries or signed up with the armed forces. Twenty-four days after the camp opened, the men put out the first of 33 fires in the season with the last on October 25, 1942. Depending on the size of the fire, the COs worked alongside “convicts, barflies, soldiers, Indians, men from the Reno jail, and others”. Since fire-fighting accounted for about one-fifth of the work time, men performed a variety of duties during “stand-by activity”, still always on the lookout for fires. One horseback crew aided ranchers in Nye Canyon and at Jackass Flats. Some constructed stock driveways in West Walker Canyon. Others performed irrigation and erosion control. During one month, seventy-five men deepened Mill Creek. Others cleared the channel in Desert Creek. 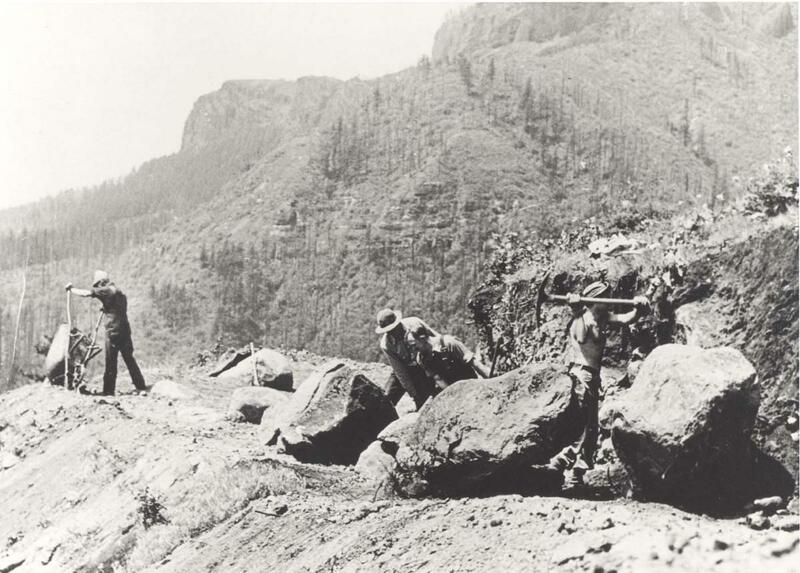 Men worked on Little Walker Creek improving irrigation for the valley. Those duties were in addition to reparing equipment, clearing brush and dead trees known as “snags”, constructing trails and cutting roads, as well as hewing timber. In some cases, men worked in timber stand improvement, including replanting burned out areas. Since CPS men came from eight or more different camps, the men shaped their governance system from experience in multiple camps. While most had served in Friends camps, they chose to ground the system so that the “general meeting” of all of the men had the final authority. This meant no vote was taken. The men discussed issues before them, modifying until everyone agreed or was willing to go along with the conclusion/s. The chair then stated what seemed to be “the sense of the meeting”. An Advisory Council made up of representatives of each of the dormitories, framed the agenda for meetings and prepared nominations for three committees: worship (10 men), education (8men), and recreation (3 men). Due to the camp’s location far from churches and with transportation at a premium, the Worship Committee planned for two Sunday services. At the 9:30 am service, a different man conducted the service each week to expose the men to forms and practices of the sixteen different denominations represented at the camp. A Sunday evening hymn sing, developed spontaneously when the camp opened, and continued. The Mono Log of July 1942, reporting on worship, noted that while the Worship Committee valued the Quaker-style silent meeting, members recognized that not all in the camp understood or had experience with the method. As a result, for the half-hour meditation period before each workday, a different person each week provided some spoken direction. They planned also to allow time at breakfast for any person to speak who had “a message for the camp”. Antelope men wired the Selective Service and administrators of the War Relocation Authority in protest of the proposal to remove conscientious objector George Yamada from CPS Camp No. 23 at Cascade Locks, Oregon to a Japanese internment camp. The November 1942 issue of Sage Opiñon, formerly the Mono Log, included a special feature “India’s Nonviolent War” and offered four books on sale in the camp library. By August 1944, the camp paper included essays on protests, walkouts and the frustrations across the CPS system, as wells as essays on Pacifism. The men first published Mono Logo in July 1942. In November 1942, that paper became Sage O’Piñon (or Sage O’Pinyon) which continued through Spring 1945. They also published Common Ground for CPS, with No. 6 (February, 1943) available in the Swarthmore archives. They printed Newsletter, the June 18, 1942 issue of which can be found in the Swarthmore Peace Collection and CPS Archives. They prepared Brown and Ochre, a graduation issue, published in January 1946. See also Jeffrey Kovac, Refusing War, Affirming Peace: A History of Civilian Public Service Camp #21 at Cascade Locks. Corvallis, OR: Oregon State University Press, 2009, the Yamada Protest pp. 63-75.